This is part one of this crochet along on GigiS blog. It took me only a day to make, because it's so small. But also I had time to work on it at grandma's. I've been talking about my grandma lately, so here is the full story. Until recently, she was a bit anti-technological. But she's now 84, and she's going to computer classes with friends, and so Mom gave her her old laptop so she could play with it. Little did she know that grandma would really enjoy it, and get the internet installed at home ! And guess who is involved in all the installation and computer tutoring? Yes, little me. Of course, as soon as we installed the internet on the old laptop, it began lagging terribly, so mom and dad got her a new laptop. And who had to set it up and give it to grandma, with explanations? yes, little me. So since yesterday, grandma has a fancier laptop than mine ;) At least she has the right tool to learn properly, and Win 7 is so much easier than XP !!! 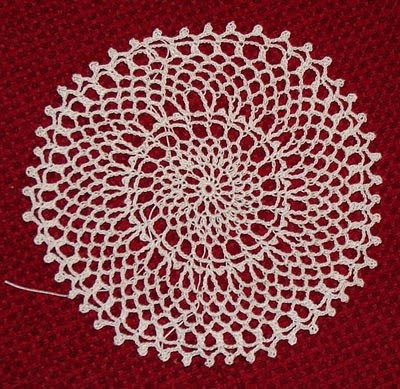 Anyway, I left her write her first emails and crocheted near her... so the doily was nearly done by the time she was finished ! Ceci n'est pas un napperon fini, mais la première partie du CAL demoiselles sur le blog de GigiS. Cela ne m'a pris qu'un jour, car je l'ai fait pendant que ma grand mère faisait ses premiers emails. Je parle souvent de ma grand mère et de ses débuts sur internet... à 84 ans. Voici toute l'histoire. Au départ, elle a été au cours d'informatique avec ses copines, et ma mère lui a donné son vieil ordi pour jouer avec. Et comme je la laisse se débrouiller en surveillant, j'en ai profité pour crocheter ! A little role reversal here... I would expect this to be about Grandma making the doily and grand-daughter working on the computer. You are very sweet to help Grandma stay trendy and the doily is very pretty. Alors, on devient accro aux Cal de GigiS ??? ?